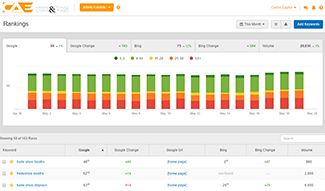 Prove and improve your marketing ROI with call tracking insights. Learn which of your marketing campaigns are performing the best, find out what keyword organic searchers use to find your site, and which ads give your business the best leads. Dynamic Number Insertion shows tracking numbers to people visiting your site based on where they came from–this tells you what sources provide the most and best leads. Gain insights into which keywords drive the most traffic, which landing pages convert the best, and which campaigns drive the most qualified leads. Learn how your users get to your site and their journey to making a call to your business. Call tracking phone numbers can be used to measure the effectiveness of your entire marketing portfolio, including both online and offline campaigns: paid search, direct mail, TV ads, print, radio and more. Studies show that a faster callback after leads submit a form means a high chance of closing the sale. Form submissions mean you can learn where your best leads are coming from and contact them while you’re still on their minds. Our powerful dashboard is full of features that can help your business develop your sales team, optimize your marketing campaigns, prove ROI for sales and marketing, and more. Make data-driven decisions with substantial and quantifiable information. Our call analytics dashboard helps your team dig into the data, observe and study trends, and find out how to optimize your sales and marketing teams for the best business performance. Get more information on your leads than just their phone numbers. Full caller ID gives you a full record and offers pop-up notices before you answer the call to give your team the details to close the sale. Learn the user’s journey through your site before they made the call–what websites pages drove the call, what they do on your site after they make a call, and more. Use that data to optimize your website and other marketing efforts. Call recording is a valuable tool that lets your team qualify leads, train SDRs and AEs, improve the sales process, and help your team succeed. Call Recording is included free-of-charge with every account. Use call tracking reports to analyze data by marketing source, landing page, PPC keyword, and other metrics. Easily export reports and phone call records for deeper analysis. Machine learning automatically categorizes your high quality leads as “good” based on multiple call factors. Use this feature to determine how effective your marketing campaigns are and what’s driving the most calls to your business.